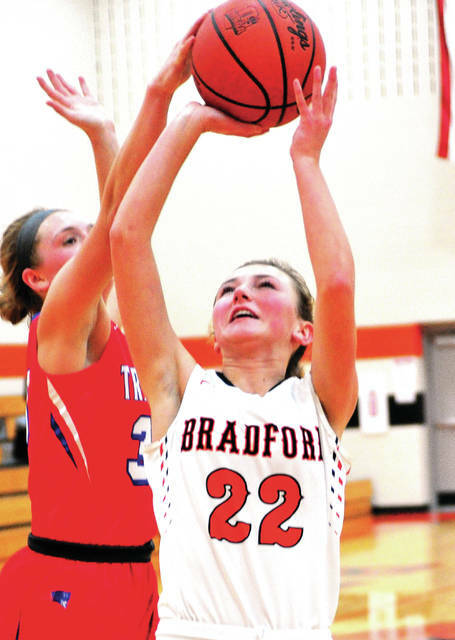 Bradford’s Austy Miller shoots over Tri-Village’s Andi Bietry Thursday night. 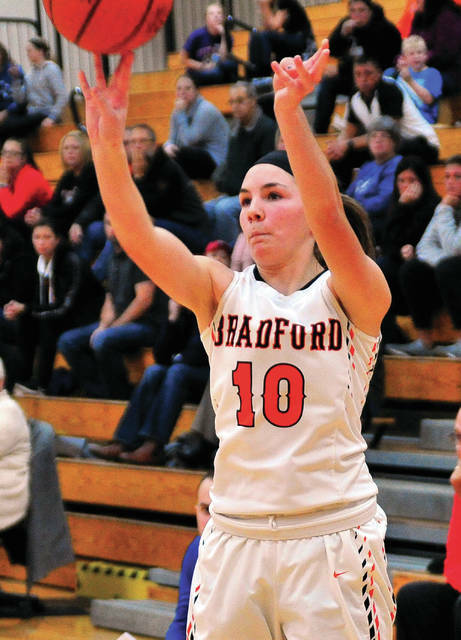 Bradford’s Alexis Barhorst gets off a 3-point shot. Bradford’s Rylee Canan shoots against Tri-Village’s Maddie Downing. Bradford’s Skipp Miller drives to the basket Thursday night. Bradford’s Bianca Keener goes up for two points. 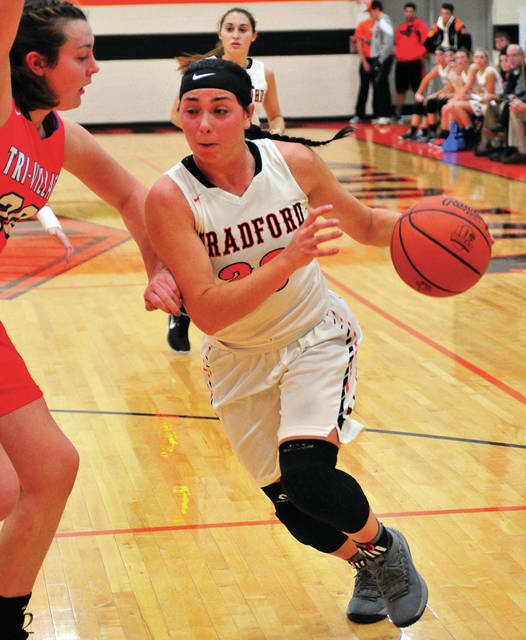 BRADFORD — Bradford coach Chris Besecker knew Thursday night was going to be a challenge. The Railroaders put their 2-0 record on the line against perennial CCC power Tri-Village in the conference opener, who came in 1-1 after an overtime loss to Versailles Saturday. And, while he couldn’t ask anymore from his defense, Besecker proved correct. The Railroaders struggled to find the mark from the start against an equally strong defense from Tri-Village and the Patriots would eventually pull away to a 37-18 victory. The offense on the other hand, was a work in progress. “We just couldn’t hit any shots,” Besecker said. And while Bianca Keener is the only Railroader that stands above 5-foot-7, Tri-Village had 6-2 Meghan Downing and 6-1 Maddie Downing inside. Still the Railroaders stayed close early. 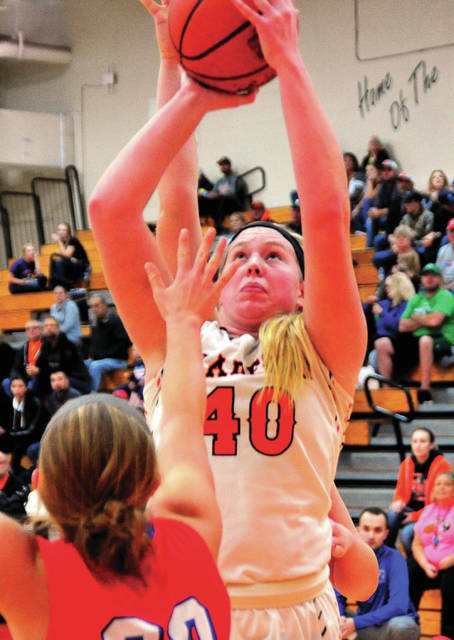 Emma Canan opened the game with a three for the Railroaders, before Tri-Village scored the next six points. Emma Printz hit two free throws and Maddie Downing and Lissa Siler had baskets. Keener answered with a basket to get Bradford within 6-5 with 3:30 remaining in the quarter. But, Siler hit a three to start a 13-4 Tri-Village run as the Patriots opened up a 19-9 lead early in the second quarter. Skip Miller stopped that run by going coast-to-coast after a steal, but by halftime Tri-Village led 22-12. And the Railroaders could never put a serious dent in the deficit in the second half, despite holding Tri-Village to four field goals in the final two quarters. 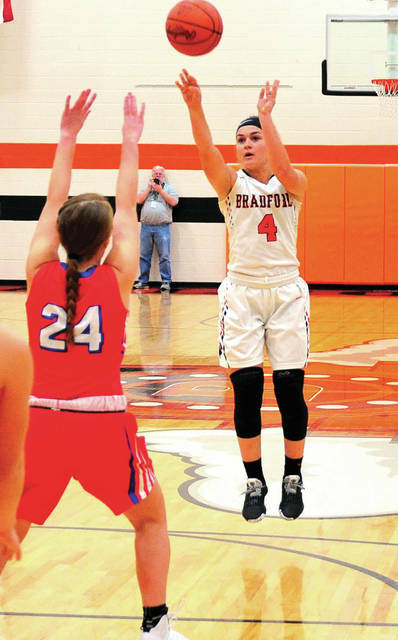 And while Tri-Village converted 13 of 20 free throws from the line for 65 percent, Bradford made just one of two for 50 percent. Maddie Downing led the Patriots with 21 points and nine rebounds, while Siler scored eight points and Meghan Downing grabbed 10 rebounds. Skip Miller had eight points and eight rebounds for Bradford and Austy Miller also grabbed eight rebounds. Tri-Village was 11 of 38 from the floor for 29 percent and Bradford was 8 for 55 for 15 percent. The Patriots won the battle of the boards 38-30, but had 23 turnovers to Bradford’s 19. Bradford has a week off before playing Ansonia Thursday. To get ready for the next big challenge. Emma Printz 0-3-3, Meghan Downing 0-5-5, Andi Bietry 0-0-0, Lissa Siler 3-0-8, Maddie Downing 8-5-21, Madison Foreman 0-0-0, Trisa Porter 0-0-0, Peyton Bietry 0-0-0. Totals: 11-13-37. Abby Gade 0-0-0, Austy Miller 0-0-0, Emma Canan 1-0-3, Skip Miller 4-0-8, Bianca Keener 2-1-5, Alexis Barhorst 0-0-0, Rylee Canan 1-0-2, Cassi Mead 0-0-0, Kendall Hill 0-0-0, Karissa Weldy 0-0-0. Totals: 8-1-18. 3-point field goals — Tri-Village: Siler (2). Bradford: Emma Canan. Records: Tri-Village 2-1 (1-0), Bradford 2-1 (0-1).